Here are my thoughts on where we are in regard to the bull market cycle. Remember, this and $3 will get you a cup of coffee. 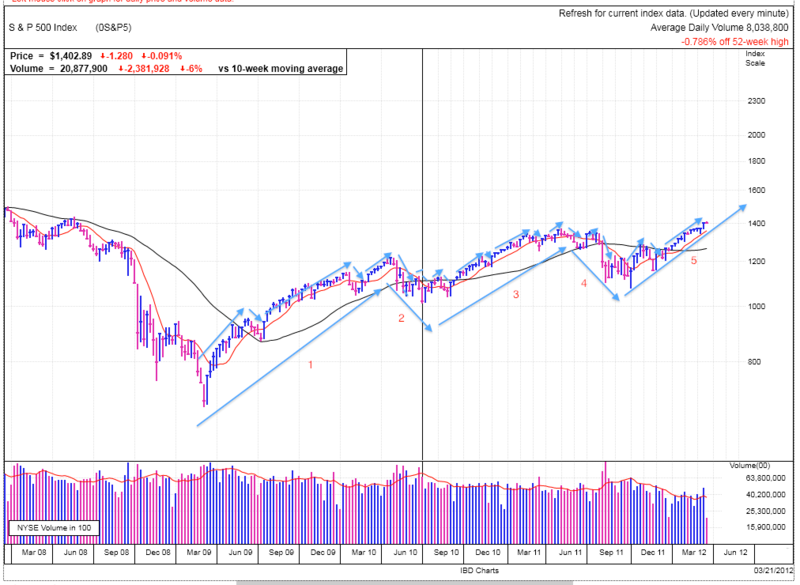 Looking at a weekly chart dating back to 2009, visually it appears the most recent follow-through rally is simply a continuation of the 2009 bull market and not the start of a new bull. We didn’t undercut the 2010 summer doldrums in 2011, so by that measure we didn’t reset the rally clock back to zero. Given how powerful the 100%+ rally since the March ’09 bottom has been, a 20% decline in 2011 is kind of smallish given the scale of the rest of the move. And lastly, the 2011 sell-off was a panic-driven, single-leg down that lasted just a couple weeks before finding a bottom. In comparison, most major market bottoms are a reversal after prolonged declines comprised of multiple legs down. In that context, it seems the recent rally is nothing more than a rebound from the panic induced selling last summer that turned out unjustified. Using this context, if we were labeling things, we might call the Summer of 2011 an abrupt correction and not a full-on bear market. It also appears to be a continuation pattern for the 2009 Bull. But semantics are semantics and hopefully we don’t care nearly as much about labels as we do about anticipating future price action. Why this is important is if we really are in wave five, that potentially means the next wave will be the start of the three-wave counter trend. Paraphrasing W. O’Niel, if we get the direction of the market wrong, then most everything else we do will be wrong too. Elliott Wave Theory is built on human psychology and shows up time and time again, but it is hard to use for timing trades because placing wave lines in real time is highly subjective. In reality, it is a big picture tool to use occasionally to put market moves in perspective and it is most useful for reinforcing other ideas you are seeing. Here is a second chart of the last few years with intermediate waves drawn on the chart showing the a smaller Elliott Wave pattern within each of the primary waves. These patterns show up all the time, but the thing to be careful of is our natural tendencies to see patterns even when none exist. But the intermediate waves seem to fit Elliot Wave Theory like a glove with their 5 waves up and 3 waves down. We just can’t keep up the pace of broad market gains we saw in 2009 and 2010. After we reach a higher level of complacency, I expect we’ll see the corrective trend. But this will still be part of a larger decade long secular bull market we started back in 2009, so view most pullbacks as buying opportunities. And if you have a buy-and-hold portfolio, have the courage to hold through the dips.